Since the beginning of Syria's anti-government protests one year ago, more than 5,000 civilians have died, according to the United Nations. And as international sanctions tighten their grip, daily life is becoming increasingly hard. Once upon a time, a walk along the souk in Al-Hamidiyeh, Damascus's most imposing indoor market, was an opportunity for quiet reflection. Even apart from the tantalising smells and the atmosphere, the place is a big as an aircraft hangar with a striking, high, pock-marked roof which seems to stretch to infinity. Now, however, it is a shop window for a newer kind of local culture - the deafening roar of scores of mini-generators which the stallholders need to power up their shops. The place is littered with them. Bright yellow or dark red, embossed with brand names like Suzuki, as if a fleet of lawnmower engines had come alive and was running the show. It is not far from the truth. 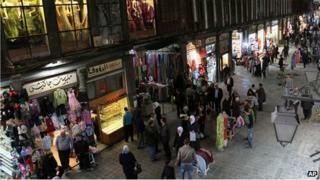 Even in relatively tranquil central Damascus, electricity is now in short supply. Two or three times a day there are long power cuts. Damascus's stallholders are adapting in more ways than one. Among the ingenious replicas of designer watches and the gorgeous sweetmeats, are equally sought-after new items - candles. I was presented with one at my hotel the other night, after an outage made the walk up the steep staircase to bed even more precarious than usual. It did not stop me falling flat on my face on the stone stairs, sustaining several bruised ribs and an aching hip. Even candles however, are not as cheap as they used to be. Before this conflict saw Syria ostracised by much of the world community, a pack of candles would cost five Syrian pounds ($0.08, £0.05). Now it is 15 Syrian pounds. And a weekly shop which would, a year ago, have cost 500 Syrian pounds, now costs 1,000. Most deleterious of all is the hike in heating oil or Mazout. It has been snowing in Syria, and many of the country's poor cannot afford to buy it - even those who can sometimes stand in long queues waiting for it only to find that by the time their turn comes, the supply has run out. Well if the miserable deadness of many of the city's usual hotspots - streets in Bab Sharqi, Bab Tuma and around the Umayyad Mosque - is anything to go by, some are simply staying at home. Others are taking refuge in the coffee bars. One hidden-away establishment in the Saruja area was full with gaggles of young men and women smoking shisha and flirting with each other. When the room suddenly turned pitch black, there was a louche murmur of general approval. Many of the shops are staying open, even in the dark. Across the road from the hotel in the barbers, I saw a row of brave customers sitting waiting to have their hair cut by candlelight. In much of the rest of the country the electricity is cut off 12 hours out of 24. Some are living without any power at all. One man with relatives in the country told me the excitement comes on the rare occasions that it is on, not when it is cut off. There is no doubt that for now Damascus remains firmly under government control, the place is a citadel, with military checkpoints everywhere. But the amount of poverty is growing, thanks in part to international sanctions. One small businessman friend, a man with no political sympathies on either side, thinks all this is going to do the opposition no favours. "Now people don't care about pro-Assad, anti-Assad," he told me, "they just want to eat." He he has lost 50% of his salary in the last year as investment flowed out of the country, and what money he does have, does not buy what it once did. Some businessmen are angry with the government but more, he says, are playing a waiting game or taking their money abroad. It is particularly frustrating for those financiers, many of them Saudi, who put huge sums of money into the Syrian tourism industry in the years before the crisis. Back then, tourism looked to be advancing in leaps and bounds, and now it lies in ruins of the wrong kind. Ask regime economists about all this and they are likely to be bullish. Even though Syria has suffered from drought recently, they will say, this year brought a bumper crop. The keywords, just like the bad old days under the current president's father Hafez, are self-reliance. Over breakfast just before I left for the airport on Thursday, my businessman friend beamed with pride as he told me he had just bought a mini-generator for his flat. "We're used to this, you know," he told me. But he in fact is in the minority. A full 60% of Syrians are under 25 years old. They want a better life, of the kind that they see on Facebook and on cable TV. And now they are taking increasing risks to speak out against the regime. And not even a bumper crop or the promise of their own mini-generator is going to buy them off. BBC Radio 4:A 30-minute programme on Saturdays, 11:30 GMT. Hear daily 10-minute editions Monday to Friday, repeated through the day, also available tolisten online.